Camping La Croix du Sud is a lovely 4 star family friendly campsite on the Cote Vermeille just 600m from the beach at Le Barcares. Sat within beautifully landscaped grounds the pitches, pathways and facilities are shaded from the sun by a plethora of scented pine trees, olive trees and oleanders giving a real Mediterranean feel to the site. The campsite is both an ideal base for exploring all the region and area has to offer and also for active families. There is plenty to see, do and explore around the campsite and there’s a range of organised tournaments, competitions and entertainment which will keep you busy into the evening. Le Barcares can be reached easily by foot in around 20 minutes or obviously less by car. Once in this pleasant seaside resort you’ll find a range of shops and supermarkets along with some wonderful French restaurants and bars which sell locally sourced food and drink. There are also some great weekly markets in the town which sell a variety of food, drink and goods. One of the best things about Camping La Croix du Sud is its close proximity to the Mediterranean sea. Within a few minutes of the campsite you can be lying on the soft golden sand whilst the rest of the family splash around in the warm waters. The area is well known for its fantastic beaches that stretch out for miles and provide fantastic fond family holiday memories that last for years. At the heart of Camping La Croix du Sud you’ll find its wonderful swimming pool complex. 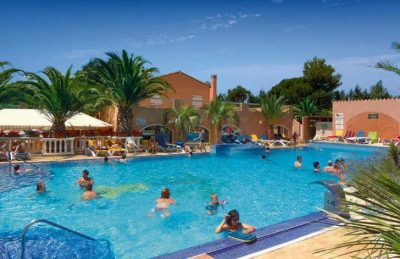 Renovated in 2015 the pool complex offers a brilliant children’s pool with water games and jets, a selection of fun slides for all ages and abilities and a lovely family swimming pool. Camping La Croix du Sud campsite offers a comprehensive selection of activities and facilities on site and also nearby to ensure you have a fantastic family holiday. On site activities at Camping La Croix du Sud campsite include a multisports area, basketball, football, volleyball, boules, table tennis, playground and cycle hire. Facilities available at Camping La Croix du Sud campsite include WIFI, restaurant, takeaway, bar, groceries, animation team, games room, tv room, washers and dryers. Accommodation at Camping La Croix du Sud campsite includes a range of 2 bedroom mobile homes that are available from Canvas Holidays .